If success of Taiwan's IT (information technology) and electronics manufacturing industries is a consequence of the government's heavy push at development of the industries, prosperity of the island's yacht industry must be an industrial miracle, because the luxury goods industry has been faring well in the global market for over 40 years but without a sound domestic market and industrial regulations to provide a basis to proliferate as other industries on the island. Although Taiwan has been engaged in construction of vessels and boats for hundreds of years, the island's capability of building yachts was first discovered to the world just during 1970s when a bumper crop of American soldiers armed for Vietnam War at military harbors on the island (an America-Taiwan relationship was still maintained) were to be discharged and return to the U.S.
For reasons, some of them, after experiencing in sailing Taiwan-made yachts for leisure purposes during their break, had recognized Taiwanese shipbuilders' ability to build yachts with good quality at low prices, and hence decided to order small-sized yachts for private use in their country. Consequently, with more and more built-to-order yachts being delivered to the U.S. and driving those original buyers' awareness of business potentials in importing Taiwan-made yachts for sale in the local market, Taiwan's yacht industry began to prosper in such a way. The latest news report from the ShowBoats International, a global yacht publication, shows that Taiwan is set to rank among world's sixth-largest supplier, or the biggest in Asia, for the third consecutive year in 2015, when the total length of megayachts and superyachts ordered with local builders is estimated at 5,312 feet. Competitive EdgesUnstinting efforts to sharpen their competitiveness over the past decades grant Taiwanese yacht builders the current golden age, according to John Lu, ex-chairman of Taiwan Yacht Industry Association (TYIA) and the president of the Horizon Group, the island's biggest yacht builder by size. He indicated that around 80% of Taiwanese yacht builders are clustering in Cijin, Siaogang and Cianjhen District, Kaohsiung City, southern Taiwan at present, and surrounded with academia and industrial resources. Through cooperation between each others, they have continuously upgraded their production and, above all, together formed a fully integrated supply chain in the port city to secure delivery and service efficiency. Another competitive strength of the industry is consummate production technologies, including 3D forming processes for FRP (fabric reinforced plastic) ship hulls, metalworking, woodworking and furnishing, all of which enable local yacht makers to stick to entire customization in design and production, leveraging Taiwan to a leading position in the global supply chain of megayachts and superyachts. Especially, Lu indicated, Taiwanese makers lead rivals with their thorough know-how about FRP properties and applications, thanks to their early involvement in FRP processing methodologies in production of small-sized functional vessels, like fishing boats, over half a century ago. Some insiders still pay great attention to research and improvement of FRP and related technologies nowadays, infusing momentum into the industry's sustainable development. Besides, success of the industry can also refer to incubation of quality workers. Lu pointed out that Taiwanese makers have been concentrated on enterprise-academia cooperation, supporting colleges, including National Taiwan Ocean University and National Kangshan Agricultural & Industrial Vocational Senior High Schools, to offer training courses and related classes to enrich skills of their employees and to attract more young workers to the industry. For instance, he added, TYIA has worked with some vocational schools to incubate students with carpenter skills to secure stable supply of such essential manpower in the industry. 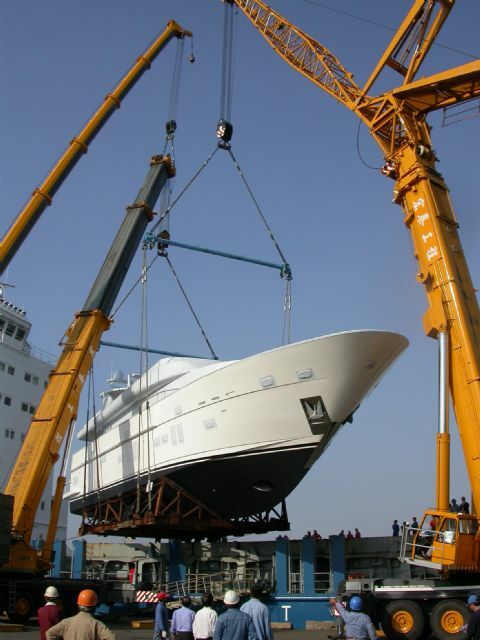 Lu concluded that following decades of hard work, a number of Taiwanese yacht builders have earned strong brand recognition among yacht owners all around the world, most of who are business tycoons and celebrities in different fields, with their dedication to value-added enhancement and satisfactory services. 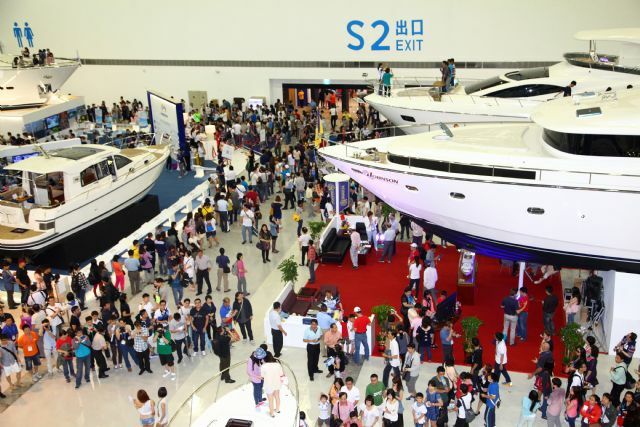 Besides, with collective efforts to boost its global position under a joint brand “Taiwan Yacht” in overseas exhibitions, the industry is still sailing well forward its promising sea, despite the recent global economic recession. 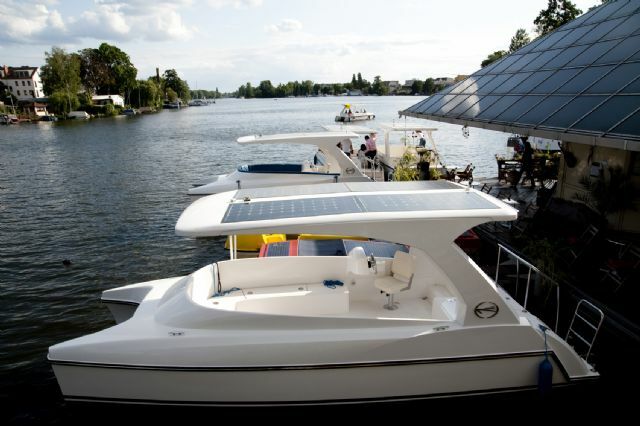 Solar-powered motor yachts are a rising trend in the global market. 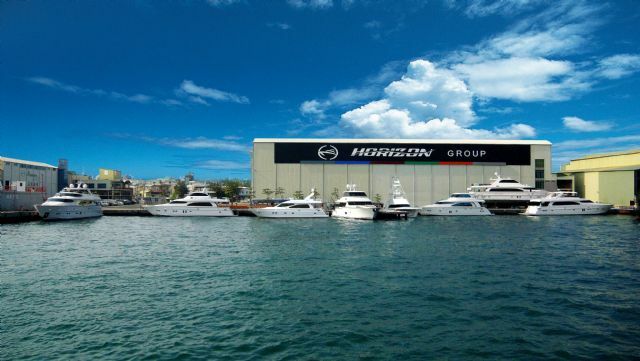 HorizonThe most remarkable Taiwanese yacht maker must be Horizon Group, with its unparalleled achievements among Taiwanese counterparts' in the global market for branded yachts deserving more spaces to be written on pages of the industry's history. Established in 1987 in Kaohsiung City, Horizon was just one of numerous negligible small-sized yacht builders in the global market then, most of who were generally believed to disappear soon with time under overwhelming influence of Italian, American and Dutch rivals. 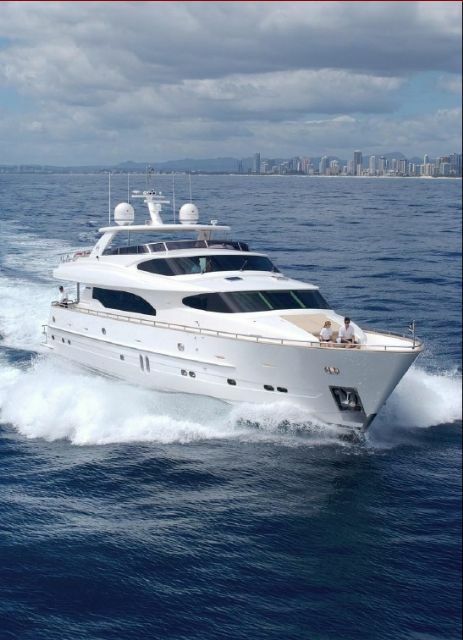 However, the Taiwanese company, under management of its CEO Lu and with farsighted business strategies and lasting dedication to production upgrades, has quickly evolved into a large-sized yacht building group as an emerging power in the global market, with Yachts International, a globally famous yacht magazine, ranking the group as world's No. 6, or the largest in Asia, in 2006. Incorporated ForceThe group is Taiwan's first and only yacht maker with incorporated subsidiaries, including three shipyards (Vision Yachts, Horizon Yachts and Premier Yachts), an FRP factory (Atech Composites), a furniture factory (Q&E Interior Mill Work) and a U.S.-based sales and service center, which respectively specialize in yacht building, FRP composites manufacturing and ship hull forming, yacht interior furnishing and customer service offering. Such a fully integrated organizational structure allows each subsidiary to engage themselves more distinctly in production upgrades according to its business functions and hence enhanced the whole group's competitiveness as both an OBM (original brand manufacturer) and ODM (original design manufacturer) in the line. For example, Atech Composites has introduced an advanced resin-infusion molding technology, SCRIMP (seeman composite resin infusion process), which can effectively shorten construction time of each yacht and strengthen durability of yacht hulls, while Premier Yachts focused on development of 105-footers and above that are mainstream in the industry. Well coordinating Atech Composite's cutting-edge SCRIMP technology that allows infusion of one-piece, lengthy hulls, and Premier Yacht's know-how about design and production of larger yachts, the group has been extremely capable of producing 120-foot plus megayachts. 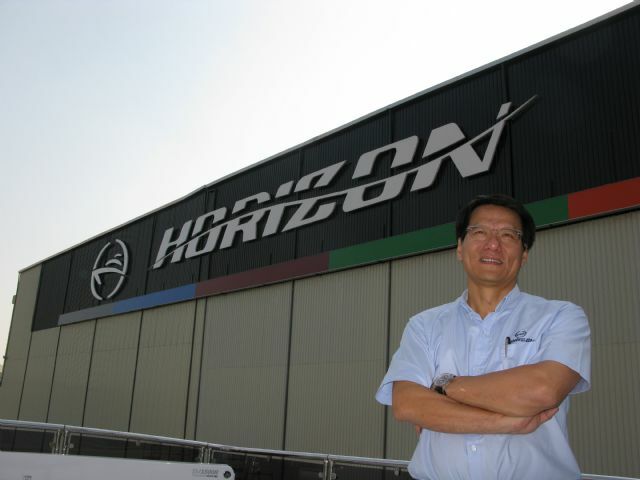 Horizon is Taiwan’s leading yacht maker (the firm’s yacht delivery center in Kaohsiung). Sailing to New EraDespite the market for new yachts turning negative, Horizon hasn't given up its potent weapon: world-caliber R&D capability in construction of megayachts, about to officially launch its newest Bandido 148 Explorer, which is a long-range, 148-foot megayacht built to BV Classification, ICE Class and MCA LY2 Compliance. With twin MTU 12V4000M60 1800-hp engines in its propulsion system, the megayacht can be sailed at a maximum speed of 15.6 knots, or a cursing speed of 12 knots, and reach a range of 4,500 nautical miles, featuring strong globally-cruising capability. Besides, the yacht is built with ABT (American Bow Thruster)'s TRAC fin stabilizers and TRACSTAR stabilizer system, assuring excellent stability when anchored or drifting. Plus, luxurious, elegant interior furnishing and spacious accommodation also add to value-added of the yacht. 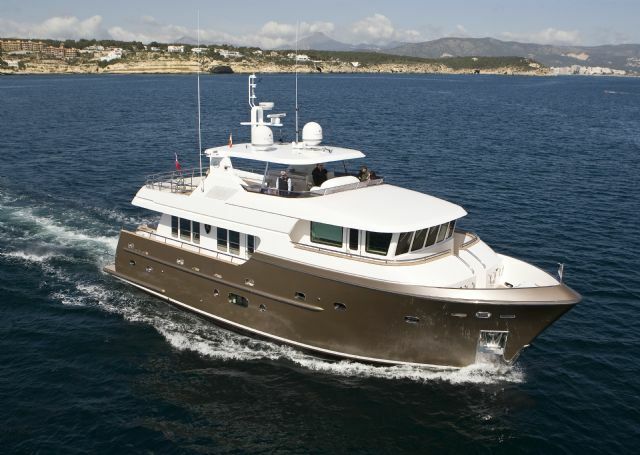 Noteworthy is that the Bandido 148 Explore is the group's first yacht developed with a steel hull and aluminum superstructure. In addition, launch of Bandido 148 Explore also denotes Horizon's leading R&D and production technologies over the whole industry on the island, as its most Taiwanese counterparts are still trying to upgrade production of 80-foot megayachts into 100-to-120-foot models. The group's another remarkable yachts, SunCat Series, which range from 23 feet to 46 feet and all innovatively adopt solar panels to supply part of electricity used in the yachts, are realization of environment-friendly vessels. Debut of the series also marks a new era of the Taiwanese yacht industry's focus on green issues. Ocean AlexanderSeven years older than Horizon Group, Ocean Alexander, founded in 1978, is one of earliest Taiwanese brands well-known among yacht owners all around the world. With decades of uncompromising pursuit of perfection in yacht construction and engineering excellence, the brand has ranked among Taiwan's big three yacht builders as well as world's top 20 yacht brands in terms of total length of produced megayachts. Johnny Chueh, president of Ocean Alexander, said that the brand started with help of American yacht designers and dealers in Seattle, the U.S. then, and the historical tie with the country has driven his firm to especially put heavy emphasis on development of American-style yachts that differ from European style yachts with more standardized design and residential facilities for family use. Knowing comprehensiveness in product line is helpful to boost brand recognition among customers, the brand supplies full range of yachts, from 30-feet entry-level yachts to 140-foot luxuries megayachts, able to match demand for yachts from the low end to the high and allowing customization on interior furnishing. Consummate craftsmanship of Taiwanese workers in the industry contributes to impressive furnishing offered by Taiwan-made yachts. The brand would do detailed engineering researches when to build a new yacht, and then repeatedly rough out designs after extensive discussion between foreign yacht designers and its engineering team on material usage, production feasibility and engineering optimization till it is perfect. The intensive planning and engineering contributes to unquestionable strength and stunning exterior of superstructure, for example, as the brand has been capable of applying extruded I-beams made of aircraft-grade 6061 aluminum and further reinforcing the key parts with unidirectional carbon fiber for hardness 10 times to original ones to frame the house and desks of a yacht. Besides, the brand also builds high-end electrical systems that are vastly used in F16 fighter into its yachts and makes propeller shafts with S2HS steel for the safest steering and sailing. “We impress customers with fanatic dedication to engineering,” says Cheuh. “The efforts can be strongly felt everywhere on each of Ocean Alexander's yachts, allowing users a comfortable sailing.” With unceasing concentration on engineering upgrades, the brand has recently cooperated with a U.S.-based, globally famous yacht builder, Christensen, on production technologies of 160-foot and above megayachts. Through the partnership, the brand is well on its way to a leading position in the segment for increasingly popular large-sized yachts. Jade YachtsDespite only 11 years old, Jade Yachts Inc., founded in 2004, must be equally influential with the oldest Taiwanese yacht builders, as the firm's first contract order placed by Louis Vuitton's chairman Bernard Arnault for building a luxurious yacht, Amadeus, has further underlined the island's competitiveness in the yacht industry. Jade Yachts's vice chairman Memphis Han noted that his firm decided to begin as the first shipbuilder specializing in construction of megayachts and superyachts with steel hulls and aluminum superstructure in Taiwan, in consideration of FRP hull construction technologies already well-developed in the industry then. Technically supported by its parent company, Jong Shyn Shipbuilding Company, a large-sized commercial ship builder with annual output of over 240 steel ships with weight ranging from 450 to 2,200 metric tons, and consistently improving quality, Jade Yachts has quickly been entrusted by yacht buyers all around the world, especially in Europe, for its top-notch production capability of steel yachts from 90 to 200 feet in length and with globally-cruising capability. The firm is also the only yacht maker certificated by DNV (Det Norske Veritas) in Asia. To Build Boutique YachtsJade Yacht's success in the line can't be merely judged by its output volume of only 3 to 4 yachts a year, but by its strenuous and unremitting attention to produce the best yachts as the palaces on the sea. Even though selling for a prohibitive price of up to US$10 million per unit, far higher than the average of US$1.35 million in the industry on the island, the firm's Jade-branded yachts have been well-received among professional yacht players all around the world. Jade-branded yachts' hulls, despite being assembled by numerous pieces of steel plates, are meticulously finished into a thoroughly curved shape without visible joints protruding outwards. In tooling, each piece of wooden furniture is sanded and painted layer by layer, while metal parts are carefully polished until surface is smooth and bright as a mirror. Plus, the brand uses high-graded materials, including marble, leather and clothing, and employs famous interior designers to furnish deckhouses of yachts, in efforts to create beauty and elegance that can be easily perceived by passengers whenever they are in the deckhouse. Grand HarbourAlthough not bigger as the aforementioned counterparts, Grand Harbour Yachts Inc., established in 1978, however, is the most influential Taiwanese yacht builder in Hong Kong, because the company contributes over a half to the total yachts exported to the market from the island a year. B.H. Gung, president of Grand Harbour, said that he decided to set up the company after decades of his career in Kha Shing Enterprise Co., Ltd., one of Taiwan's big-three yacht builders, merely in an attempt to construct his own range of yachts. 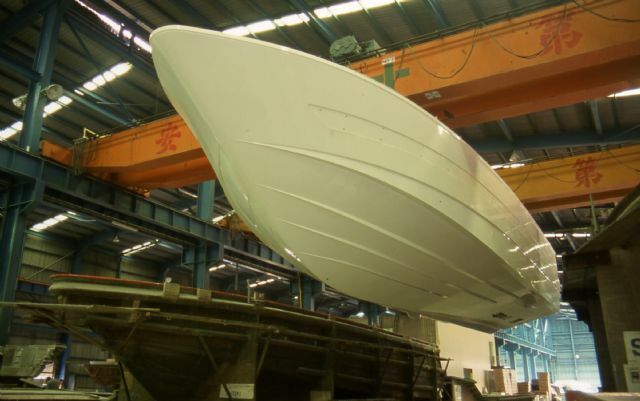 Presently, the company builds yachts ranging from 45 to 90 feet as the mainstream products in its shipyards in southern Taiwan, with some exported under own brand Grand Harbour while the remaining on an OEM (original equipment manufacturing) basis. Worth mentioning is that the newest yard, though online for only 3 years, is within close distance of the harbor and can build up to 10 yachts at a time, allowing the company more flexibility in production.. Although the global downturn has caused severe sales declines in the industry so far this year, Grand Harbour cushions the impact with actions very well, according to Gung. “Responding to increasingly tightened credit in the financial market, we have improved production efficiency to offer more friendly prices for yacht buyers,” he says. “In addition, we are keener to customization on yacht designs to achieve product variety.” The strategies work obviously, as Grand Harbour suffers a slighter drop in its sales this year than most of its Taiwanese counterparts. Excellent interior furnishing has been a major feature of Grand Harbour's yachts, with fine furniture finishing given more attention. Gung mentioned that his company specially sets up a woodworking workshop and a painting room for production of furniture in-house, in efforts to make sure that each piece of furniture is finished well. 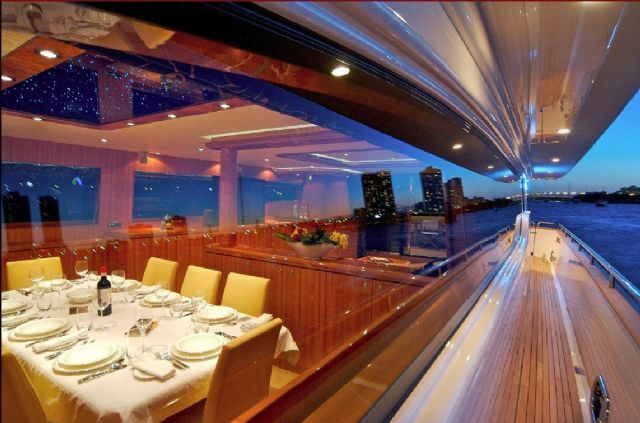 Also, the company has vastly applied the high gloss paint methodology to fit up its yachts, effectively reinforcing visual appeal through atmosphere of luxury. Another decisive factor for Johnson Yachts's current achievement is the long-term cooperation with Taiwan's officially funded USDDC (United Ship Design & Development Center) on upgrades of key production methodologies, including application of a specially designed bulbous bow in its displacement yachts, Chyan cited, adding “An positive learning-by-doing attitude drives us to consistently absorb advanced technologies to better our yachts.” That's why company's own brand, Johnson, can be accepted by both U.S. and European buyers. Sensitive to gloomy climates in the yacht market, Johnson Yachts has earlier moved to streamline its organization and made practical operation strategies to counter the upcoming hardship than its rivals since last year. One of efforts the company has done is collaboration with Taiwan's Export-Import Bank to offer client-friendly payments, like installment payment lasting for up two years, for those with a good credit history. 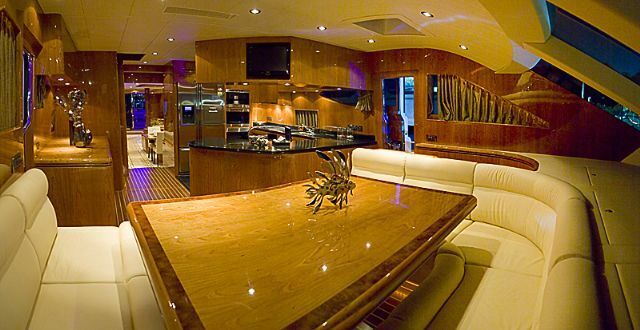 Also, the company fits up new yachts with upgraded facilities free of charge for buyers. In the meantime, Johnson Yachts has paid more attention to problem solving in after-buying services. Chyan said that the company dispatches its senior engineers to the destinations where its yachts are located to help yacht owners with maintenance services, no matter how far the locations are. “In addition to boosting brand recognition, such services are also beneficial to Johnson, as our engineers can gradually advance in knowledge about problem solving,” he states. 2nd TIBS Set to Fuel MomentumDriven by the prosperous local yacht industry, TYIA's newly inaugurated chairman, C.H. Chang, also the president of Global Yacht Builders Co., Ltd., one of Taiwan's best-known yacht makers in Hong Kong, China and other Southeast Asian nations, noted that the 2nd Taiwan International Boat Show (TIBS), scheduled to open on March 10, 2016 in the Kaohsiung Exhibition Center, is expected to see a bigger turnout than the earlier edition.